This past weekend, I went camping up in north Georgia. While I was sitting there watching my friend Tyler build the fire, my mind kept thinking of how each of our lives are like campfires. I got out a piece of paper and wrote my thoughts down...and here is what I wrote down. 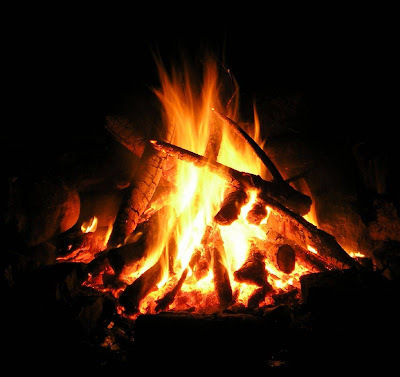 A man begins to build his fire by gathering wood, sticks, and kindling. The Lord does the same thing when it comes to each of our lives. When the time is right, the Lord will place a fire in our lives for different reasons. As we go through life, we get stabbed with sticks and thorns. Out of this we anger because we do not know how to handle these sticks, and we are scared. Those sticks are only going to be used as fuel for our fire later in life. As a man builds his fire, he begins with a spark which he places within kindling. Once that happens, the man blows air into the kindling allowing the spark to ignite into a flame. The Lord also ignites a flame in our lives just by breathing that life into us. This is the start of a beautiful thing. The next thing a man will do when building his fire is place the burning kindling into a pile of logs. The small sticks and the moss on the logs will catch fire, eventually catching the logs on fire. When the Lord puts that fire in us, small things in our lives begin catching that fire for the Lord. As time passes, the flame engulfs the entire pile of logs, or our whole lives. What a beautiful site it is to see a raging fire. How warm. How bright. How powerful. As the fire continues to grow and grow, more logs are added to the pile. The Lord burns off what is bad in us. He prunes us to bear more fruit, or when compared to a fire, he burns us to produce more heat. The Lord builds and grows the fire for Him in our lives. There are times when that fire begins to get small again, but the Lord always provides. He always adds more wood to our fire so we can continue to burn for Him. 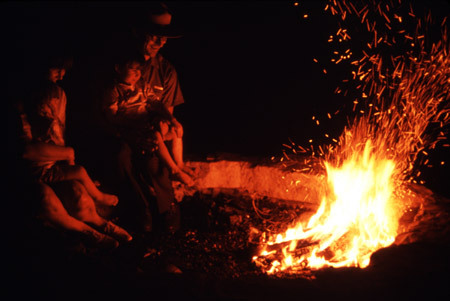 When the campfire gets big enough, small little embers and ash fly into the sky like fireflies. When the fire within us grows strong and bright, small sparks fly off of us and effect people and things surrounding us. We do not know which way the smoke will blow, but we trust and know that there will be smoke as a product of the fire. How beautiful is the fire the Lord places in our lives. Lord, burn a fire for you in me. There are a lot of profound thoughts there--I enjoyed your insights!